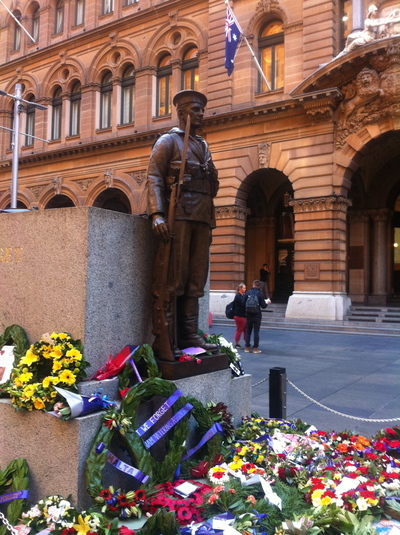 Some people have paid their respects at The Cenotaph, Martin Place. Not just Sydney, however, as you know, all of the capital cities in Australia pay their respects for those who fought for us in the major battles. For example, at every ANZAC Day Dawn Service ceremony in particular, people show up in abundance and pay their respects accordingly. Do you attend the ANZAC Day Dawn Service at Martin Place? Why do you attend? I'd say Martin Place despite the crowds. If you live on a train line, there are excellent train services to get you to the Martin Place dawn service in time. The ambience is definitely all about 'paying your respects in the right place,' and there are ample places to grab a coffee. If you're happy to stand for a bit, Martin Place is your destination. A free hot drink and an ANZAC cookie was provided to train commuters at the 2013 dawn service. You are at the hub where soldiers were recruited for Gallipoli. Is Sydney a liveable city? Best aquatic centre in Sydney? Best chocolate tea in Sydney?